The successful collaboration of The MacKenzie Companies’ brokerage and capital markets divisions has led to the sale of Holly House Apartments, a nine building, 44-unit multi-family apartment complex located at 6110 – 6114 Edmondson Avenue, Catonsville, Maryland. MacKenzie Commercial Real Estate Services, LLC’s Karen Deeley and Chris Bennett represented the owner in the transaction and worked to identify the buyer. John Black, President of MacKenzie Capital, LLC and Brendan Harman, Assistant Vice President, provided the buyer cash-out, portfolio recapitalization which facilitated the acquisition financing. The complex was built in 1964 by brothers Pete and John Farley and has been owned and operated by the Farley family since its inception. 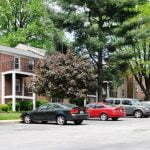 The well-built and well-maintained complex is situated just inside the Beltway in the attractive Catonsville area of Baltimore County and offers residents accessibility to numerous nearby amenities, multi-market access via its convenient location to I-695, and mass transit options. MacKenzie advised the owner on how to maximize this value while taking advantage of the strong apartment market. “Working with MacKenzie throughout the sale process could not have gone smoother,” stated Carol Farley Tessier. “We enjoyed working with them and were impressed not only with their professional expertise, but also their ability to identify multiple interested buyers, ultimately achieving a per-unit value that exceeded our expectations by nearly 15%,” stated Tessier. Introduced by Deeley and Bennett, MacKenzie Capital was able to structure a cash-out refinancing of the buyer’s existing multi-family properties to use as equity to capitalize the acquisition and improvements of the purchase. For more information on the full service offerings of MacKenzie, please visit www.mackenziecommercial.com.